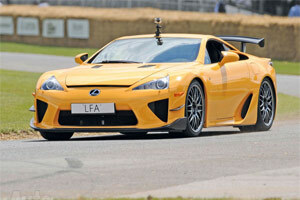 Autoexpress was one of the publications that took the hill climb in the Lexus LFA Nürburgring Edition at last weekend’s Goodwood Festival of Speed, and now there’s both an article and video about the experience. While the video presenter does describe the LFA “the world’s most dubious supercar”, both reviews are extremely positive, especially on such a short trip (the hill climb course is only 1.16 miles). Update: Edited for clarity. krew: Good point -- my feathers got ruffled because of the word "dubious". I've edited the post for clarity. Travis: Fabulous video of one of my fav cars of all time.